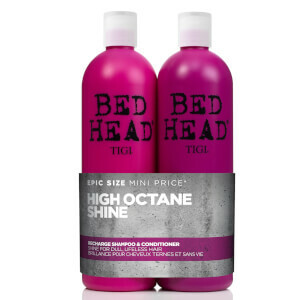 Boost your blonde with the TIGI Bed Head Dumb Blonde Repair Shampoo and Reconstructor, a duo of brightening and revitalising formulas for natural and colour-treated hair. 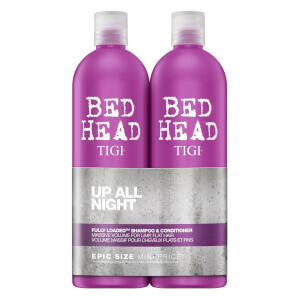 The shampoo and conditioner work together to restore hydration, strengthen strands and create vibrant, vivid locks. 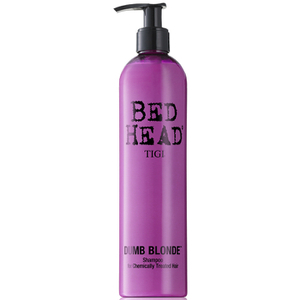 Keep your blonde shining bright with an expert cleansing formula for those that have more fun. The colour-safe shampoo uses Fibre Actives to penetrate the hair fibre and repair damaged proteins within, leading to a stronger and healthier structure that is fortified against future damage. A nourishing blend of Keratin and Milk Protein work to smooth the hair cuticle to reduce frizz and improve manageability, leading to softer, shinier and more vibrant locks. Restore brilliance to blonde hair with a nourishing conditioner for colour-treated locks. Powered by Protein Booster Technology™, the formula helps to repair chemically damaged strands from root to tip, whilst strengthening the hair fibres to prevent against future breakage or drying out. The creamy conditioner smooths away frizz and flyaways to improve manageability and softness. Whether used as a daily treatment or a leave-in mask, hair will be strong, silky and shining. 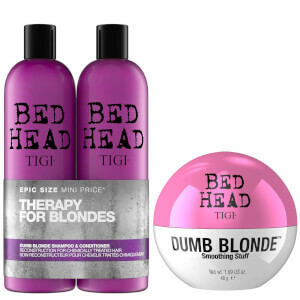 For natural and artificially coloured blonde hair. Conditioner: Apply to mid-lengths and ends of hair after shampooing. Leave up to 3-5 minutes and rinse well. To use as a mask, leave in 5 to 10 minutes. Shampoo: Water (Aqua/Eau), Cetearyl Alcohol, Cetyl Palmitate, Stearamidopropyl Dimethylamine, Glycerin, Lactic Acid, Fragrance (Parfum), Arginine, Lysine HCl, Hydrolyzed Keratin, Hydrolyzed Milk Protein, Behentrimonium Chloride, Dimethicone, Phenoxyethanol, Hydroxypropyl Methylcellulose, Dipropylene Glycol, Polyurethane-39, Potassium Chloride, Disodium EDTA, Amodimethicone, Magnesium Nitrate, Cetrimonium Chloride, PEG-7 Propylheptyl Ether, Phenylpropanol, Propanediol, Caprylyl Glycol, Methylchloroisothiazolinone, Magnesium Chloride, Methylisothiazolinone, Tocopherol, Yellow 5 (CI 19140), Yellow 6 (CI 15985). Conditioner: Water (Aqua/Eau), Cetearyl Alcohol, Cetyl Palmitate, Stearamidopropyl Dimethylamine, Glycerin, Lactic Acid, Fragrance (Parfum), Arginine, Lysine HCl, Hydrolyzed Keratin, Hydrolyzed Milk Protein, Behentrimonium Chloride, Dimethicone, Phenoxyethanol, Hydroxypropyl Methylcellulose, Dipropylene Glycol, Polyurethane-39, Potassium Chloride, Disodium EDTA, Amodimethicone, Magnesium Nitrate, Cetrimonium Chloride, PEG-7 Propylheptyl Ether, Phenylpropanol, Propanediol, Caprylyl Glycol, Methylchloroisothiazolinone, Magnesium Chloride, Methylisothiazolinone, Tocopherol, Yellow 5 (CI 19140), Yellow 6 (CI 15985).